Car, Fabian Garzon Studios, 442 McAdam, Lux & Lumen, ASMALLWORLD, AtwellCorp, Musically Yours, Deirdre Mallehe, Broken Doll Clothing, PRODUCT Magazine and several other high-end brands to be announced are proud to bring CONVERGE to Toronto. Following a successful series in Calgary, this bi-monthly networking gala has been hailed as the "future of modern-day networking" and will quickly become the destination event for professionals, entrepreneurs, organizations, brands and of course Torontonians looking to connect and experience. The gala will again 'CONVERGE' the true influencers and cultural innovators in the realms of entrepreneurship, crowdfunding, music, real estate, sustainability, law, film, gaming, food, fashion, politics, finance, technology, philanthropy, sports, and more in Toronto. This is an opportunity to unite all of our collective ideas, intelligence, backgrounds and experiences with one another. Each event will have a specific focus, and for the launch it will be Fashion, with this coming CONVERGE coinciding with Toronto Fashion Week. Each CONVERGE edition will also feature a cast of four successful entrepreneurs who will do 10-minute presentations followed by a Q&A about their respective businesses detailing the trials and tribulations they have gone through on their paths to success. The Showcase Panel will feature four progressive entrepreneurs in select industries. Tickets will be available for $30 in advance (at select outlets to be announced soon), and at the door if available. RSVP by March 20th to convergeTO@gmail.com, to guarantee adJoin the C&C Girls, Jessie and Leah as they attend Toronto’s hottest networking event CONVERGE. Toronto is one of the world's next great emerging metropolises and centres of culture and commerce and it is filled with some of the most ambitious and creative business leaders and social entrepreneurs. CONVERGE will bring them together on an on-going basis beginning Friday, March 22nd at the historical and palatial Windsor Arms Hotel in downtown Toronto. Event sponsors including the Windsor Arms Hotel, NOKIA, SociaLIGHT, TEDx, UBER Private Car, Fabian Garzon Studios, Perdue Films, 442 McAdam, Lux & Lumen, AtwellCorp, Broken Doll Clothing, PRODUCT Magazine and several other high-end brands to be announced, are proud to bring CONVERGE to Toronto. Following a successful series in Calgary, this bi-monthly networking gala has been hailed as the "future of modern-day networking" and will quickly become the destination event for professionals, entrepreneurs, organizations, brands and of course Torontonians looking to connect and experience. 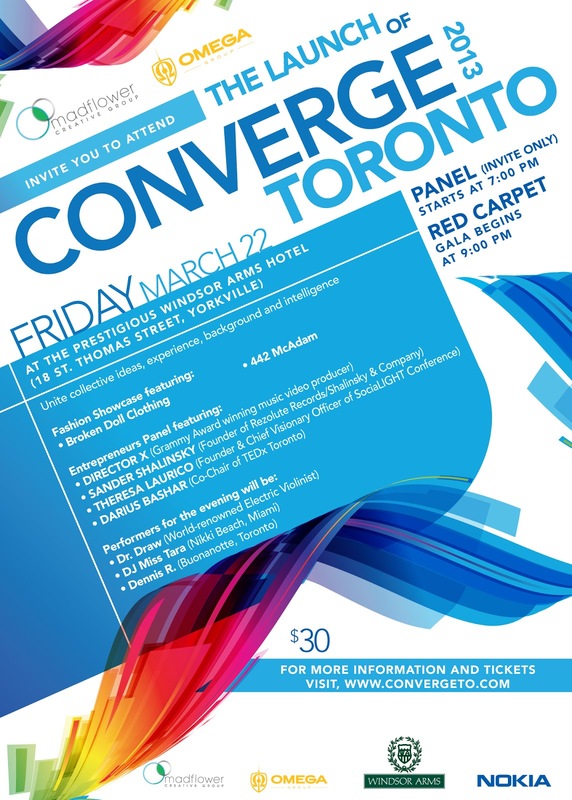 The gala will again 'CONVERGE' the true influencers and cultural innovators in the realms of entrepreneurship, crowd-funding, music, real estate, sustainability, law, film, gaming, food, fashion, politics, finance, technology, philanthropy, sports, and more in Toronto. This is an opportunity to unite all of our collective ideas, intelligence, backgrounds and experiences with one another. Each event will have a specific focus, and for the launch it will be FASHION, with this coming CONVERGE coinciding with Toronto Fashion Week. RSVP by March 20th to convergeTO@gmail.com, to guarantee admission. The gala will again 'CONVERGE' the true influencers and cultural innovators in the realms of entrepreneurship, crowdfunding, music, real estate, sustainability, law, film, gaming, food, fashion, politics, finance, technology, philanthropy, sports, and more in Toronto. This is an opportunity to unite all of our collective ideas, intelligence, backgrounds and experiences with one another. Each event will have a specific focus, and for the launch it will be Fashion, with this coming CONVERGE coinciding with Toronto Fashion Week. RSVP by March 20th to convergeTO@gmail.com, to guarantee admission.